Use sub-calendars, customized calendar links, feeds, and more to keep projects organized and moving forward. It’s a challenge to manage a group with multiple projects of varying scope. Keeping all the information organized — and keeping everyone on the team on task and clear on what they need to do — gets a lot easier when you use Teamup. This is a common work scenario. If you lead a design team, for example, you’re working with a group on multiple projects and tasks all the time. You might have recurring in-house design needs, as well as client projects that vary in scope and timeline. As the team lead, you also need to know the schedules, abilities, and assignments for each individual on your team. It’s a lot of information to manage. This is where Teamup really shines: consolidating multiple streams of information into one easy-to-use interface. 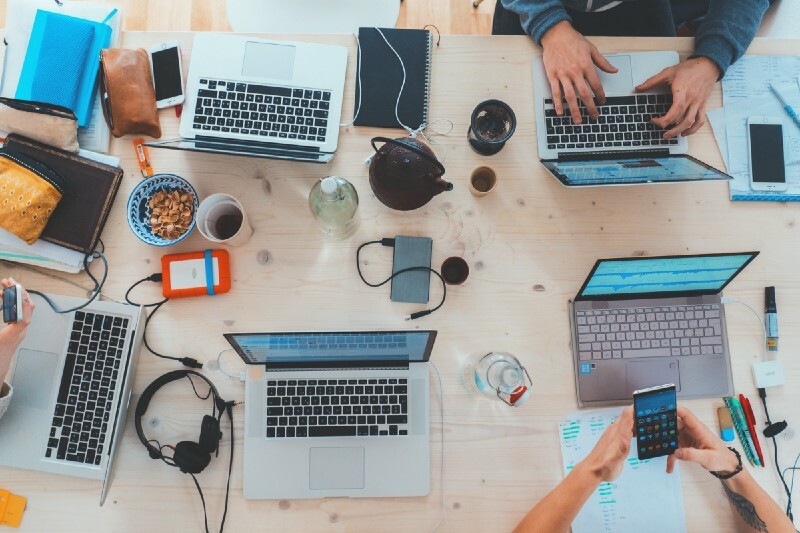 “Your calendar is the only one I’ve found that has a team function that is not only usable, but extremely simple to set up.” — Bert W.
Let’s say that you’re leading a design team of five people (including you) for a marketing agency. You have regular in-house design needs, though they don’t always occur on a predictable schedule. Your team also handles all the design work for client projects, which can range from “simple” (a logo redesign) to complex (a complete rebranding package). 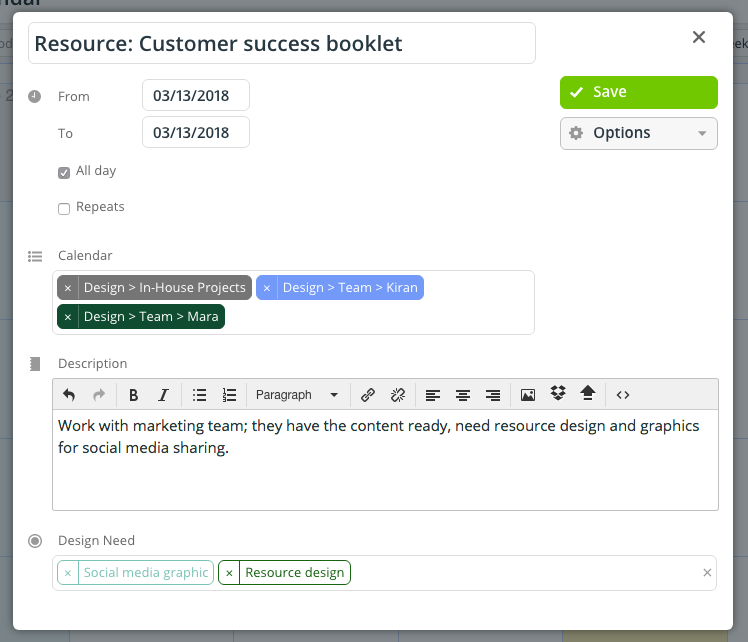 Let’s look at how you could use a Teamup calendar to keep all the information sorted and scheduled, without losing flexibility. First, you want to be able to work with individual team members on assignments and schedules. So create a calendar for each member of the team. Include yourself, of course. Organize your calendars in a folder by using a folder name or names, and > to create a hierarchy. In this case, you’ve created a main “Design” folder. Then you’ll nest another folder and set of calendars in it for the Design Team, by using Design > Team > Calendar Name. Use “>” to create an organized hierarchy of folders and calendars. Now each person on your team can share their schedule (meeting, away from office, etc. ), receive assigned tasks, and share updates on their progress on their own, designated calendar. Your next set of calendars might be for projects or clients. In this example, you’ve created a Client Projects folder (nested in the Design folder), with individual Client calendars, as well as a calendar for In-House Projects. Here is what the hierarchy of calendars will look like on your sidebar. You can use a customized event field to specify the type of project, then have that field’s data appear on the calendar view. You can assign an event to more than one sub-calendar and customize event fields. How the event detail appears when you hover over it in Month view. When you’ve set up the sub-calendars the way you want them, create a unique access link for each member of your team. You can set their permissions as needed (and these can be changed at any time). For example, you may want all team members to see what’s happening on a client’s rebranding project, so they can be aware of schedule conflicts. But if only two people are actively working on the project, they’re the only ones who need modify permissions for the sub-calendar. 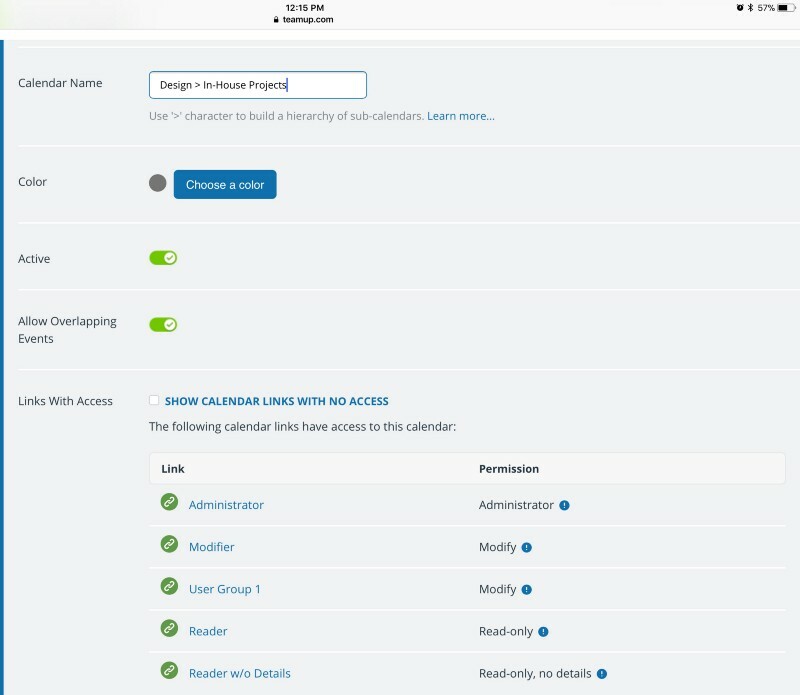 As your team opens and closes new projects, you can modify the permissions for each person’s link as needed. You can easily see and modify the active links for each calendar. Perhaps your team needs to work closely with another team or individual on a project. If so, you can set up ways to share information via your Teamup calendar. It’s very important to consider security when sharing a calendar feed. If you set up a calendar feed with your administrator link, then anyone with that feed can get the admin calendar key from the feed URL (and then have admin access to your calendar). To maintain security and share information, first set up a link with appropriate sharing permissions. Then set up the feed from that link. Read more about setting up secure iCalendar feeds. 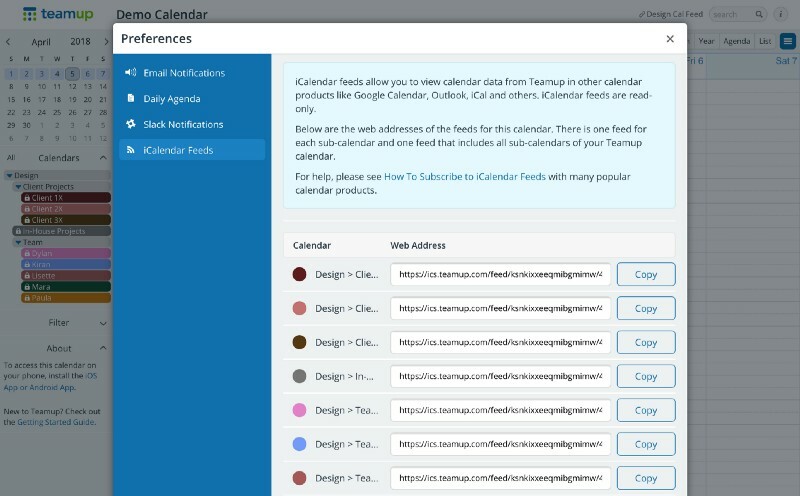 You can share calendar feeds with other individuals or departments; this way they can receive information from your Design calendar onto their own. The feed works with multiple calendar choices, such as iCal, Google Calendar, and Outlook. Set up a secure calendar feed by opening up the calendar from a link with appropriate permissions. Then go to Settings > iCalendar Feeds. Copy and paste the link for the calendar you want to share. You may need to coordinate with the sales department, for example, to go over the materials your team is helping them create for the annual conference. Create a sub-calendar for the annual conference, then share the feed link with their departmental calendar. It’s pretty great to eliminate the hassle of multiple back-and-forth emails about time availability and progress on various tasks. The calendar feed lets everyone see what’s happening, and when. You can also set up a unique link for a department, colleague, or client. Using links to share information is really helpful in these situations, because they don’t require a login and you can close them out when needed. Perhaps you want a client to see the timeline on their rebranding progress (again, saving an email barrage of questions about “How soon my logo will be finished?”); set up a read-only link to the project calendar for the client. Go to Settings > Sharing, then click New Link at the top. When the project is closed out, simply delete the link. The information is still saved on the calendar itself. 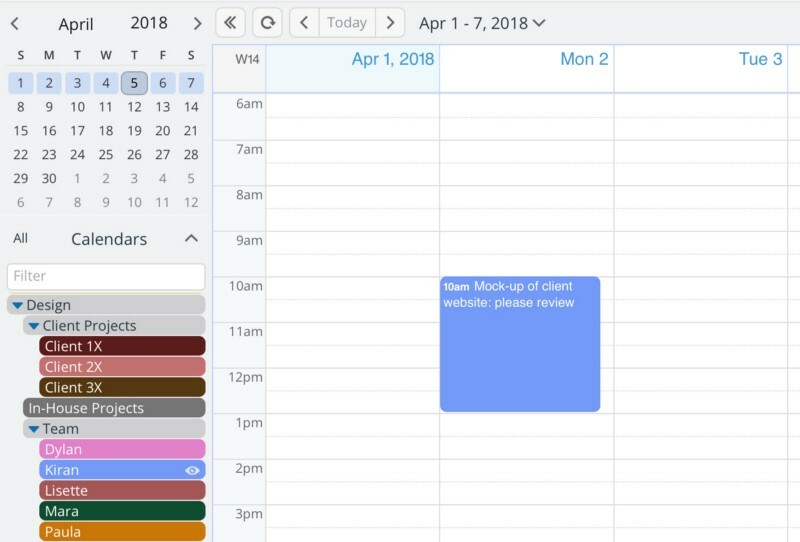 The calendar views let you see what’s happening on your team, and in various projects, from a high-level perspective or with focus and details. For a high-level view, turn on all calendars (or the active ones) and view in Month or 4-Week view. Month shows you the current month; 4-Week view shows a 4-week span, starting with the current day. Go to Year view to see how the next several months look. This view can help you anticipate busy seasons and ensure that you don’t overbook your team with, perhaps, two major projects wrapping up at the same time. 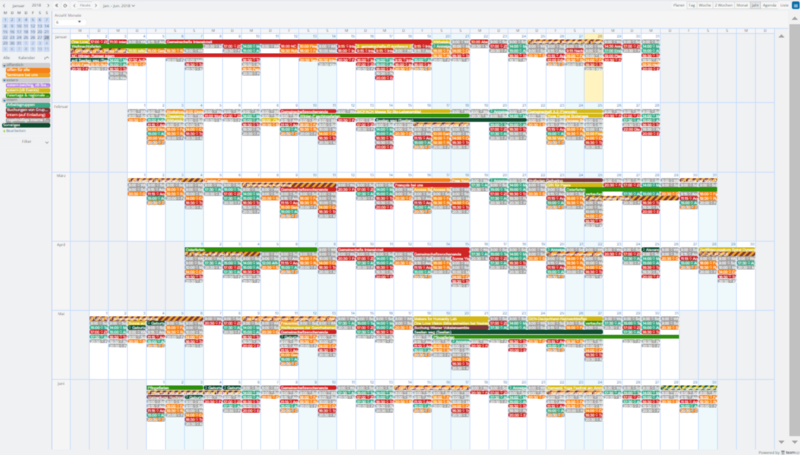 A calendar view with events of 6 months. You can view 1 month to 12 months at a time. The Scheduler view is helpful for moving events from one sub-calendar to another. Toggle on the calendars you want to see, then you can drag an event from one calendar to another easily. All your team members can use this feature to move completed tasks on to the next person. Here’s a demo calendar where you can try it out. 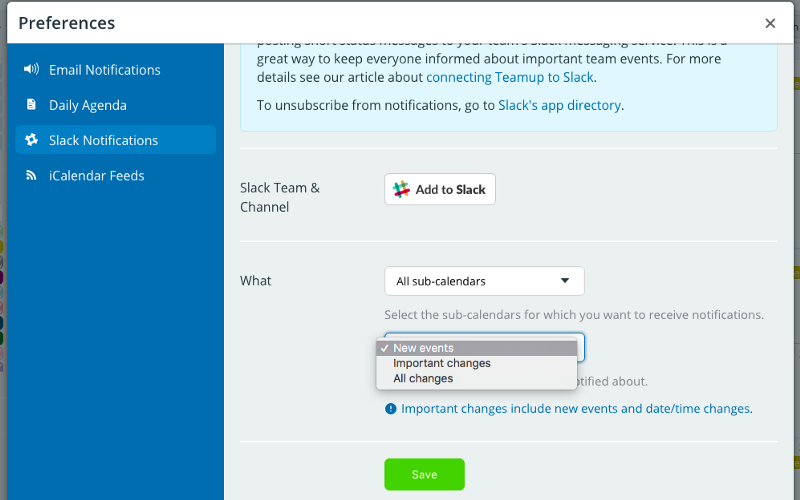 You can also integrate your Teamup calendar with Slack. Changes in your calendar will be automatically fed into the Slack channel you choose. Follow the same security protocol for setting up iCalendar feeds and use a link with appropriate permissions (never your administrator link). You can decide which changes to include in the notifications (that way you won’t overwhelm the channel with too much information). Choose which events you want to include in your Slack notifications. Here’s more info about setting up Slack notifications in a group channel or private channel. There are many other scenarios that involve managing projects with a team. Even one-off projects, like a school assignment, can be easier when you have a single, simple way to manage them. Have questions about how your team could benefit from Teamup? Check out our Inspiration page for ideas, or get in touch to talk through the particulars of what you need. Header photo by Marvin Meyer on Unsplash.